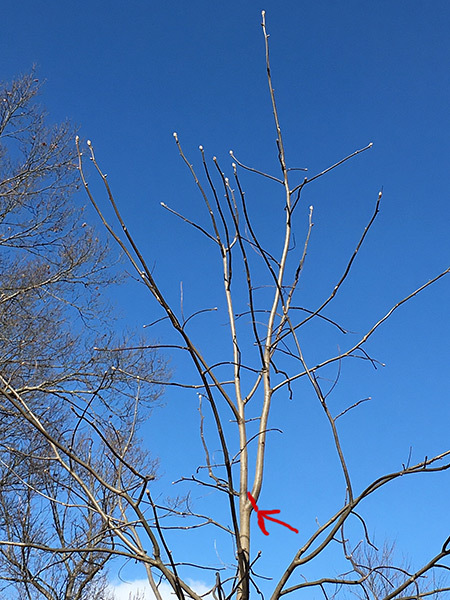 I have a 7.5 year old Hickory tree that's about 10-15 feet high, and I recently noticed it has two competing leaders, which start about 4 feet from the very top of the tree. I understand this is not good, because it will weaken the structure. What it looks like has happened, is that a sub-branch attached at a 45-degree angle (weak angle) near the top of what was the main leader, outgrew the original leader and is now fighting to be the dominant leader. It has branches of its own, and is actually currently taller and thicker than the upper part of the original leader. The original (vertical) leader is just starting to be displaced to the side a bit at a very slight angle, and is not quite perfectly vertical anymore. Ideally, I'd have caught this a few years ago and snipped it off then. But I'm thinking now is the next best time. I'd like to encourage the original leader to take over again, so the tree regains its proper structure before it gets any larger. It's a good amount of tissue to remove, but I've been very conservative so far with this tree. The buds are just starting to get larger. I was planning to prune this next week, and cut off the competing leader entirely where it attaches. Here's the photo. I've indicated where I plan to make the cut. Any comments? Is this the correct choice? As I understand it, double leaders and 45-degree attachment points are not positive things and it should be pruned to eliminate them. Did it a few days ago. Maybe a little late in the season, but it's done.